The seemingly endless criticism of LeBron James from the national media (and no doubt shared by many fans outside of Miami) feels more personal in nature rather than objective journalism. By all accounts, James committed a big error in judgment last offseason in the way he left Cleveland – i.e., “The Decision” and not informing Cavs owner Dan Gilbert. However, people are very quick to forget that many athletes, including the legendary Michael Jordan and Magic Johnson, have run-ins with management/coaches that they do not handle well from a PR perspective. The bottom line is that young, talented and ambitious athletes under endless scrutiny are prone to make mistakes; and LeBron is no different. The other reality is that no athlete other than Tiger Woods has come into a sport with the fanfare and expectations that LeBron did, a fact that is particularly important to remember in today’s social media age where no stone is left unturned. LeBron has also been vilified because he chose to team up with other stars in Miami rather than go-it-alone in Cleveland like stars of the past. Conveniently lost in the shuffle is the fact that parity is much greater in the NBA today than it was in the past. In the 80’s, the league’s best players were concentrated on a handful of teams. The overall talent pool from top to bottom was not nearly as deep as it is today – this is why it seemed as though the Celtics, Lakers and Sixers were contending for the title every year. In today’s game, star players are present throughout the league on many teams. Recent Celtics and Lakers teams have shown that one player, even Kobe Bryant, cannot get you over the top. Dirk Nowitzki may be the latest example of this, even though he has a much better supporting cast than LeBron ever had in Cleveland. The fact that LeBron joined Miami through free agency rather than a trade merely reflects the economic reality of today’s NBA, but does not change the underlying formula required to win. Another major criticism of LeBron is that he’s not the last second(s) “closer” that Jordan and Larry Bird were, or that Kobe Bryant, Dwyane Wade and even Nowitzki are today. But he is a legitimate closer to the extent that his team wants to get the ball in his hands at the end of a close game because they trust him to make the right decision, whether that be to shoot the ball or pass it. To be a closer by the narrow definition of executing the winning shot every time requires one to not only be a perimeter player, but also to be a natural shooter/scorer, effectively eliminating both the great low post players of the game due to the ease with which they can be double-teamed and also the pure playmakers of the game as scoring is not their primary responsibility. Herein lies the fundamental disconnect between what LeBron actually is and how he is analyzed. While LeBron may not average the rebounds, assists and points of Barkley, Magic and Jordan respectively, LeBron possesses a combination of rebounding, passing and shooting skills that may be unparalleled in the history of the game. He balances his contributions in these areas according to what he must deliver in order for his team to win. To compare King James to any individual player of the past reflects a lack of understanding of what his true value as a player is. In any event, it is a debate best suited to the end of his career when we have seen his entire body of work. As LeBron’s career unfolds there may be situations where he needs to focus on one of these skill sets more than the others; only time will tell. For now, he is taking full advantage of playing with Wade and focusing on his all-around game (including lock-down defense). Emotions aside, no one would dispute that a player maximizes his value to a team by doing whatever it takes to win, even if that means deferring to a teammate at times. The funny thing is that LeBron seems to be one of the few people out there who genuinely understands this. What similarities and differences, if any, do you see between Michael Jordan and LeBron James after their first seven years in the league? As for similarities, both LeBron James and Michael Jordan proved to be resilient athletes who were able to withstand the physical demands of the league. They took a pounding night in and night out and still performed at an extraordinary level. LeBron missed just under four games per season on average. And outside of the year Michael broke his foot, he missed only one regular season game during the first seven years of his career. Both Jordan and James got to the foul line a lot because of their fearless driving abilities. And both high flyers took flight wearing Nike. Neither was afraid to be a vocal leader. And both were voted NBA Most Valuable Player twice in seven years. Though Jordan and James entered the league with reputations of not being the greatest of shooters, they got better each year and became capable of leading the league in scoring. However Jordan held the title for a whopping ten years. With sharp shooters like Kevin Durant in the mix, it will be tough for LeBron to touch that record, especially now that he’ll be giving up shots to help teammates Dwyane Wade and Chris Bosh get shots. There are some other differences: Jordan won the NBA Slam Dunk competition twice and even entered the NBA Three-Point Shootout though people said he didn’t have any range on his shot; LeBron has yet to participate in these All-Star Weekend events. 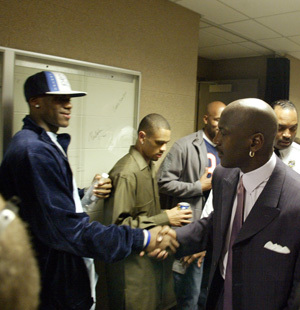 Jordan was still with the Bulls after seven years while LeBron is no longer with the Cavs. Jordan won an NBA Championship in his seventh year and LeBron is still seeking his first. Then again, Jordan had Steve Kerr as a teammate and LeBron does not. The Czar breaks down Michael Jordan’s overtime shot in the 2003 All-Star Game. The Czar of the Telestrator examines ”The Shot” by Michael Jordan over the Cavaliers in 1989.